Today I braved the first extremely cold Sunday of the season to check out Susan Benjamin’s talk on Candies Through the 19th Century at the Mount Vernon Hotel Museum and Garden on the Upper East Side. And I’m so glad that I did! 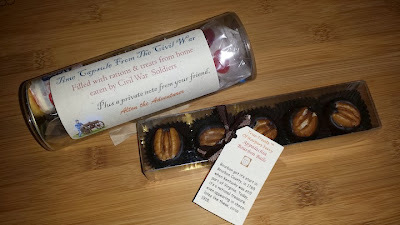 Besides being held in a really cool former carriage house turned hotel turned museum, (which everyone should check out), I was delighted by Ms. Benjamin’s animated presentation and knowledge of the history of candy. As founder and President of Cool Confectionaries, based in Harpers Ferry, West Virginia, Ms. Benjamin runs the nation’s only historic candy company offering authentic candies from the Native Americans through the 1950s. Her museum talk offered a rare interactive learning and tasting experience focusing on the origins of a variety of different confectionaries including - sugar plums, licorice bark, Turkish delight, Necco wafers, jelly beans, and many more. Here are a few interesting tidbits from the talk: rock candy was first made widely popular in the saloon drink called rock and rye, as well as for its medicinal usages; jawbreakers and fire balls were created by a father and son team and still take 14-19 days to create; and, candy canes, as they were originally created, did not have red stripes. The red stripes were added much later on, around 1900, as a marketing idea. I definitely recommend checking out Ms. Benjamin’s website to find out how you can get a taste of candy history!